^ "Sari, Always in Vogue". Hinduism Today. Retrieved 9 March 2018. ^ Abbott, Phill (19 February 2009). "Rethinking silk's origins : Nature News". Nature. 457 (7232): 945. doi:10.1038/457945a. PMID 19238684. 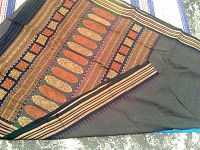 ^ "Nivi Style Saree Draping". 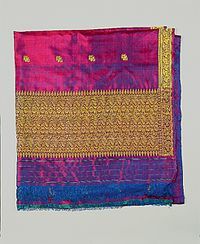 Indian Wedding Saree. 10 April 2018. Retrieved 16 January 2019. ^ "Dressing the Indian woman". 6 December 2014. Retrieved 17 March 2019. 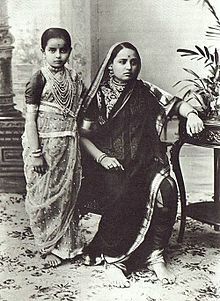 ^ "9 Facts You Might Not Know About The Sari". Google Arts & Culture. Retrieved 17 March 2019. ^ "18 Traditional Saree Draping Styles From Different Parts Of India". The Ethnic Soul. 25 January 2017. Retrieved 30 October 2018. ^ "Air India". 15 June 2011. 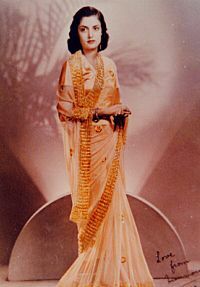 ^ "Handy tips to wear a saree 'Air-hostess' style!". Sareez.wordpress.com. 20 February 2011. Retrieved 13 November 2011. ^ "Hard earned Paisa Vasool shopping - Times of India". The Times of India. Retrieved 10 July 2017.